I host a personal mail server for my family which 2degrees have attached the subdomain mail.IP as the PTR for the reverse DNS so that the mail routes correctly and doesn't cause trouble. Can Spark do this as well? If not, I presume a Dynamic DNS/IP provider could (for a price of course) assuming that Spark allow delegation. We have a voip line provided by 2degrees, does spark do voip or is it copper only? Our fritz!box is setup for VOIP and I'd like to keep it simple. Appreciate there are others I can use such as 2talk but looking to limit the amount of external providers. How is the performance? 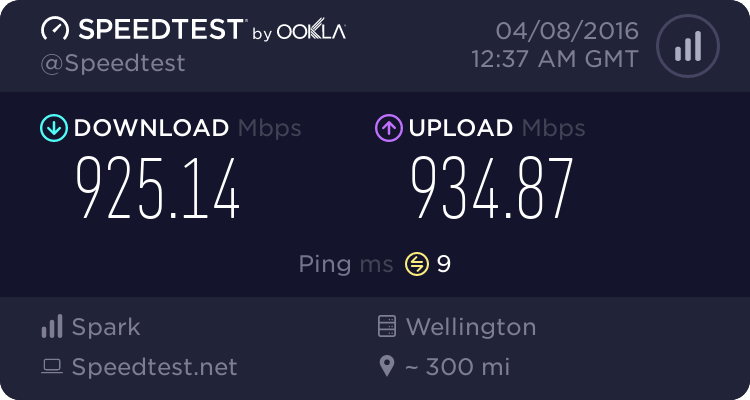 My line is capable of ~37/7 on VDSL and I get that with 2degrees with little latency across NZ and to aus for gaming. Is Spark ok in this regard? How does the 'free' lightbox work? Is it for the life of the plan or are their end dates that Spark could introduce? How does the fanpass sub work? I understand that spark issue a voucher code for use, but I presume its a year long sub split in to months (billed by Spark) rather than a month by month offer? Apart from the early exit fee of $99 if prior to 6 months, there is no other limits? Do Spark offer more than 1 static IP for residential customers? Does anybody know when Spark's IPv6 stack is coming? I'm used to 2degrees dual stack and use it currently. Its not the end of the world if its not available soon but it would make life easier. Anything else that I should be aware of? I've had awesome performance from 2degrees but the offers from Spark are peaking my interest as I look to reduce my entertain budget. I do game yes, not as much as I used to but I'm getting ~30ms to sydney and ~10/15 around NZ centres... If the latency is not vastly different I'd be more interested in the other aspects as that is one of the primary drivers for the potential change. IIRC Spark do VoIP from the ONT (not from the router), using the phone port on the ONT so it looks like a landline to the customer. I think that you'd have to buy your VoIP service from someone else if you want to do a pure VoIP solution. They've just said that the flash new Spark Sport service is effectively IPv4 only - the Spark presenter at NZNOG said that if an RSP wanted to do v6 "we could talk about that off-line", which I took to mean "you're kidding, right?" 4. At this stage Lightbox is free until Spark say otherwise. 8. Personally I’ve always had rock solid performance, and they’ve always been quick to respond to any queries I’ve had through Facebook. Probably best to stick with 2degrees, best thing Spark has is Fan Pass at $30, vs 6 months normal cost $60 a month. I’d be very surprised if they discount their other Sports for their customers. They tried to up the cost of fibre, and others didn’t so there’s been a $6. back down there. I'm not sure I understand the idea behind this post. 2degrees is either the same price as Spark or cheaper. Or do you mean you're paying for lightbox right now and want it included? Its the media addons I'm looking at trying to get cheaper; fanpass is $25.99 cheaper and lightbox is free... total saving of ~$40 per month plus I can then look at my Sky sub too. Stick with 2degrees if you can. I moved to 2degrees from spark a month ago and am very impressed. With their great Fritzbox router you get 2 seperate phone lines in and out without any extra cost because there are 2 phone ports on the router and they are independent of each other. The performance on my 1gig plan is the same as it was on Spark which is what you would expect. There are more advantages with the phone such as getting missed call messages from you phone etc. BT: No, Spark doesn't offer PTR updates to point to a custom DNS entry for retail broadband. BT: You'll get line speed, and perhaps a slight increase in performance especially with international due to tweaking that has been done to improve performance. BT: You'll need to check with Spark on the T&Cs. When I had it, it was free based on the fact you have an active broadband connection. BT: With netflix it was a one off credit to cover 6 months, I suspect fanpass would be the same. BT: It was "on the horizon" when I worked there 12 months ago, but I suspect the engineers are focused on RWC right now before IPv6 launch. BT: The VoIP on the ONT or if you are not UFB just standard POTS service may be a step backwards. Spark doesn't offer Voicemail to emails which is one feature I like with 2D.